The Basilica of St John Lateran was built in the 4th century by Constantine the Great and was the first church built in Rome. 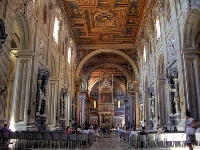 It is the cathedral of the Diocese of Rome, and as such ranks above all other Roman Catholic churches, even St Peter's Basilica in the Vatican. It is the official ecclesiastical seat of the Pope, and it is here that he celebrates Mass on certain religious holidays. The building has suffered much damage in the past and has been rebuilt several times, leaving only fragmented parts of the original church. The present building is characterised by its 18th-century façade and contains several important relics, a 13th-century cloister and an ancient baptistery. Inside are numerous statues, paintings, the High Altar that can only be used by the Pope, and a cedar table that is said to be the one used by Christ at the Last Supper. Across the street is one of the holiest sites in Christendom, visited by pilgrims from around the world: the Palace of the Holy Steps, believed to be the 28 marble steps originally at Pontius Pilate's villa in Jerusalem, that Christ climbed the day he was brought before Pilate. They have been in Rome since 1589.